The American Educational Research Association (AERA) holds an annual meeting that brings together researchers from across North America. This year the AERA conference was held from Friday April 8 to Tuesday April 12 in New Orleans, Louisiana and had the theme “Inciting the Social Imagination: Education Research for the Public Good”. While many researchers were not able to physically attend AERA we did have an opportunity to participate virtually. Through the dedicated efforts of AERA presenters, attendees and members armed with mobile devices we have been given a glimpse into the discussions and have been given access to online resources through Twitter. Although Twitter is largely known as a tool for social networking it provides a great opportunity for knowledge mobilization. As conference attendees listen to the presentations they sift through the materials and share the more salient points through short (140 character) posts. As you might expect there are the occasional tweets about getting together with friends and commentaries on local restaurants but there are also links to websites and research studies. For example, one of the presentations highlighted recent American research that explored relationships between grade 3 reading skills, poverty and high school graduation. While the majority of the presentations highlighted American research, Ontario was well represented with presentations from the Ontario Ministry of Education, Universities such as Queen’s, OISE, UOIT and Western. 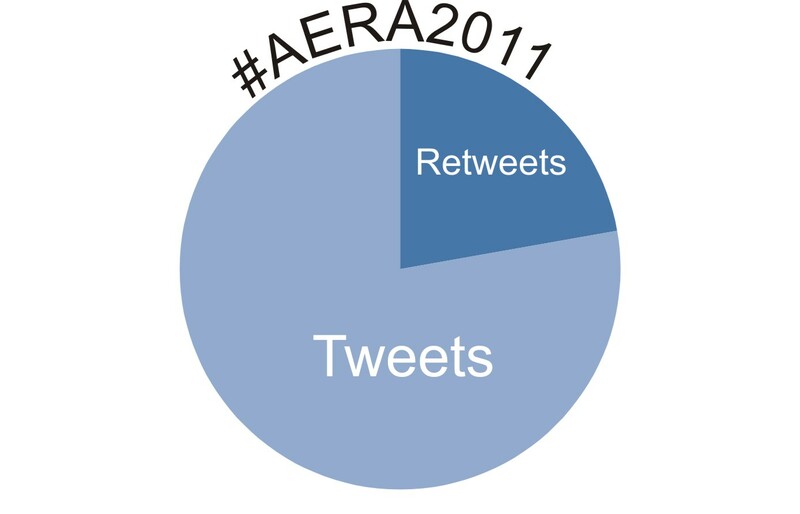 Prior to the AERA 2011 it was generally agreed by the #AERA Twitter community that the keyword (referred to as a “hashtag”) #AERA2011 would be used to identify comments related to the AERA events. Not only did this coordinate the posting of comments but it also provided a reliable approach to analyzing comments about AERA. Using R (a statistical language and platform) the package twitteR and assistance from Jeff Gentry (the author of twitteR), I have compiled and summarized tweets from the 2011 AERA meeting. I am more than happy to share the file with anyone who is interested, simply send me a quick email. Of the 1292 tweets 77.8% (1006) were original tweets and 22.2% (287) were retweets (comments thought to be worth repeating, identified with the prefix RT). There were 291 people who posted something about AERA. 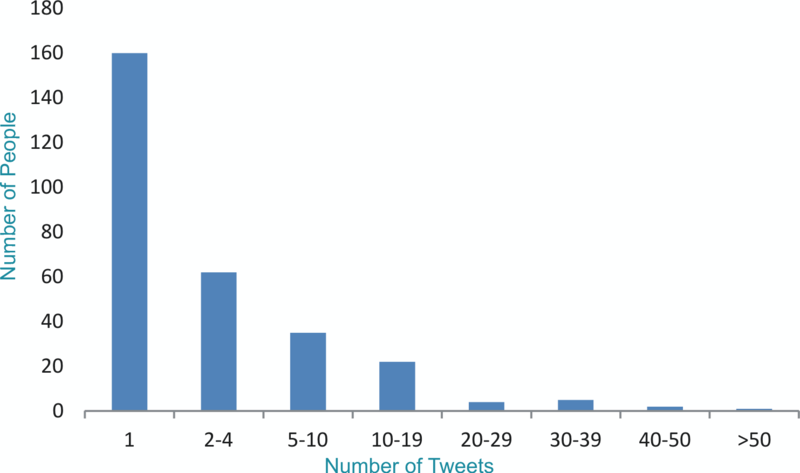 The three most prolific tweeters were ETSresearch (75), pm_rodriquez (46) and mcdanger (40). The majority of people (160) sent only one tweet during the conference. “Why does US have fewer students excelling in math-science? We’re self-absorbed says Gary Phillips of AIR” (10 times). 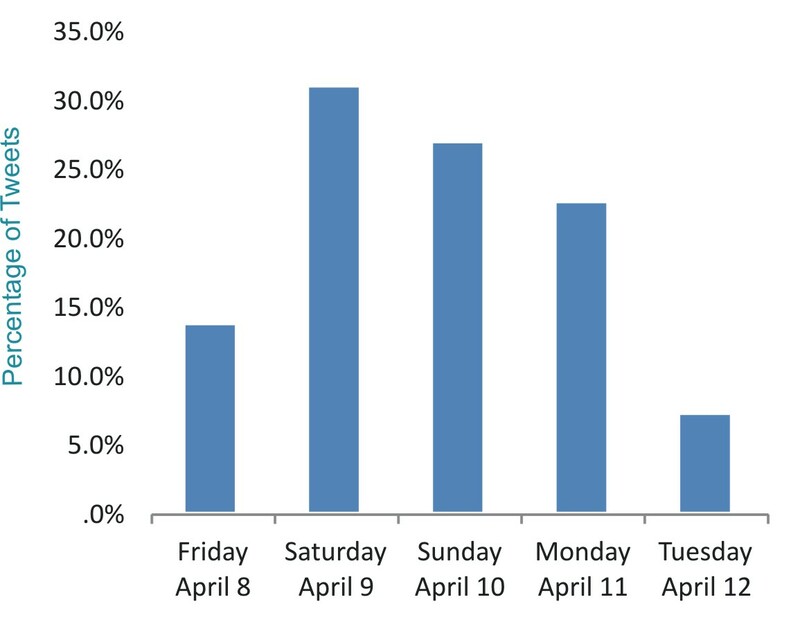 Perhaps not surprisingly, Saturday was the busiest with 30.7% (396) of the overall tweets for the conference. Thank you to EVERYONE who attended AERA 2011 and made it possible for us to share in the learning. This entry was posted in Research Resources and tagged AERA, Education Research, R, Twitter. Bookmark the permalink. Chris, this is great. Thanks for doing this. It’s good to see more people using Twitter at AERA as each year goes by. Thanks for the comment and the link to your post. When I get a few spare moments, I’ll try tagging the tweets using your categories. I love your “verbing” category. This is terrific Chris! I will be sure to display some of those tweets on our website! Thanks for sharing. Two of our People for Education researchers attended too – they are also at OISE. Watching the use of twitter grow at AERA is encouraging. It also helps spread the knowledge beyond the “research world” and helps mobilize it to teachers, parents or anyone who might be able to use it!